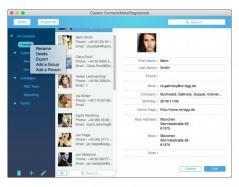 Cisdem Contacts Mate is a practical application that can analyze and repair various problems related to OS X Contacts. You can also use the app to export the Mac Address Book for simple backup and sync. The supported export formats include CSV, HTML, TXT, Excel, vCard, DOCX, Pages, and Numbers. Cisdem Contacts Mate can be used to batch fix contacts with the same problems, organize contacts into groups and manually set prefix or suffix.